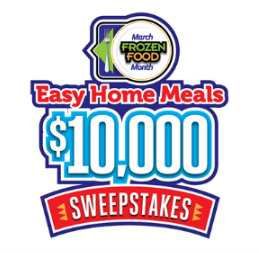 Easy Home Meals March Frozen Food Month $10,000 Sweepstakes – Win $5,000! ENTER SWEEPSTAKES HERE – Easy Home Meals Sweepstakes page. ENTRY LIMIT – Limit one (1) Entry per email address per day during each Weekly Entry Period. ELIGIBILITY – SWEEPSTAKES ENTRANTS MUST BE LEGAL RESIDENTS OF ONE (1) OF THE FIFTY (50) UNITED STATES, THE DISTRICT OF COLUMBIA AND PUERTO RICO WHO ARE THE AGE OF THE MAJORITY WITHIN THE JURISDICTION FROM WHICH THEY RESIDE ON THE DATE OF ENTRY TO BE ELIGIBLE. SWEEPSTAKES ENTRY PERIOD – The “March Frozen Food Month $10,000 Sweepstakes” (the “Sweepstakes”) begins at 12:00 AM Eastern Standard Time (“EST”) on February 21, 2017 and ends at 11:59:59 PM Eastern Daylight Savings Time (“EDT”) on March 31, 2017. PRIZES – ONE (1) GRAND PRIZE: One (1) Winner will receive one (1) check made payable to his/her order in the amount of five thousand dollars ($5,000). ARV of Grand Prize: $5,000; and FIVE (5) WEEKLY PRIZES: Five (5) Winners will each receive one (1) check made payable to his/her order in the amount of one thousand dollars ($1,000). ARV of each Weekly Prize: $1,000. TOTAL ARV OF ALL PRIZES: 10,000.